Eligibility: Community partner registration begins in mid-February and closes in mid-March. Students who would like to volunteer can begin registering in mid-February. For more information, visit CommunityEngagement.IllinoisState.edu/Students/Community-Service/Bring-It-Back-To-Normal or contact Paige Buschman, graduate assistant for community service projects for the Center for Community Engagement and Service Learning, at vpsapebusc2@IllinoisState.edu or (309) 438-1100. What: This celebration will highlight civic engagement efforts and recognize faculty, staff, students, registered student organizations, community partners, and campus units for their civic engagement work and activities. Eligibility: The celebration is open to the public. For more information, visit AmericanDemocracy.IllinoisState.edu, or contact Dean of Students John Davenport at jmdaven@IllinoisState.edu or Associate Professor Noha Shawki at nohashawki@IllinoisState.edu. What: Emphasize the value of citizenship, service learning, and civic engagement in your course. Identify civic competencies that connect with your discipline and course content; design a syllabus, which includes civic engagement components; and develop a plan for a specific course assessment where students demonstrate some aspect of civic learning. This redesign opportunity can be used to develop a course for possible adoption as a civic engagement minor elective. A $1,000 stipend, provided by the American Democracy Project, is available to eligible participants who complete the program. When: Four sessions will be held in late May and early June 2018 with a presentation at the Summer Showcase in August. Eligibility: Applications will be available in February and due in March. Tenured, tenure-track, and nontenure-track faculty, and Administrative/Professional employees with teaching responsibilities are eligible to participate. Eight faculty members will be selected. For more information, visit CTLT.IllinoisState.edu, or contact Dana Karraker, faculty development coordinator at the Center for Teaching, Learning, and Technology, at dmkarra@IllinoisState.edu or (309) 438-5110. What: During September, the Center for Community Engagement and Service Learning will host several service projects. Transportation will be provided for those who need it. Credit may be offered by certain classes; ask your professor for details. Eligibility: Registration is open to Illinois State students through September until spots are filled. For more information, visit CommunityEngagement.IllinoisState.edu/Students/Community-Service/Saturdays or contact Paige Buschman, graduate assistant for community service projects for the Center for Community Engagement and Service Learning, at vpsapebusc2@IllinoisState.edu or (309) 438-1100. Illinois State University students create gifts with their Holiday Helper children. 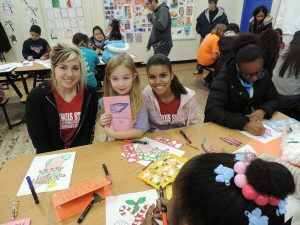 What: The Holiday Helper program annually provides gifts and parties for over 250 children in Bloomington-Normal in partnerships with the Boys and Girls Club, Western Avenue Community Center, Unity Community Center, and Center for Youth and Family Solutions. Volunteers are needed as gift sponsors, for wrapping and packing gifts, to organize the parties, and to help at the parties. For more information, visit CommunityEngagement.IllinoisState.edu/Students/Community-Service/Holiday-Helper or contact Paige Buschman, graduate assistant for community service projects for the Center for Community Engagement and Service Learning, at vpsapebusc2@IllinoisState.edu or (309) 438-1100. What: Trick-or-Treat for Change is the annual fundraising event hosted as a collaboration between the Center for Community Engagement and Service Learning, the McLean County Habitat for Humanity, and the collegiate chapters of Habitat for Humanity at Illinois State and Illinois Wesleyan universities. Each year, 300 to 400 students trick or treat in groups of four to six around Bloomington-Normal asking for spare change. This change adds up and goes to build a home here in town. In 2017 the event raised over $11,000. Eligibility: Preregistration will close October 29. Walk-ins will be accepted. Anyone is welcome. For more information, visit CommunityEngagement.IllinoisState.edu/Students/Community-Service/Trick-Or-Treat or contact Annie Weaver, student volunteer opportunities coordinator at the Center for Community Engagement and Service Learning, at (309) 438-0708 or amweave@IllinoisState.edu. What: The Center for Community Engagement and Service Learning engages in a national day of service on Veterans Day called Serving Those Who Served. This program seeks to serve veterans in the community and the United States at large by recording the oral histories of those who have served our country through military enrollment. The center is seeking veterans to be interviewed and volunteers to interview the veterans. Eligibility: Volunteer registration for veterans and student recorders begins in October. For more information, visit CommunityEngagement.IllinoisState.edu/Students/Community-Service/Serving or contact Paige Buschman, graduate assistant for community service projects for the Center for Community Engagement and Service Learning, at vpsapebusc2@IllinoisState.edu or (309) 438-1100.